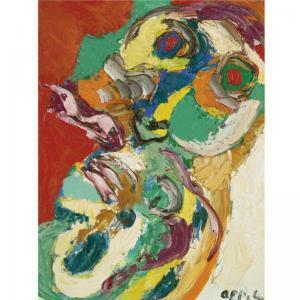 Find artworks, auction results, sale prices and pictures of Karl Appel at auctions worldwide. Oil/cardboard, 27 x 42 cm, lo. ri. indistinctly sign. Karl Appel as well as indistinctly inscribed. 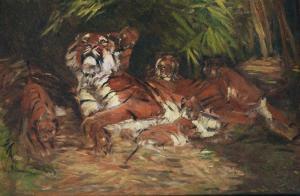 - Animal painter in Düsseldorf, studied at the Düsseldorf academy under E. Dücker, P. Janssen a. J. Bergmann, specialized in wild animals, he exhibited in Düsseldorf as well as at the Munich Glaspalast, in 1913 he returned to Hamburg. - Mus. : Hamburg (Altonaer Mus. ), Düsseldorf. - Lit. : Saur, Thieme-Becker, Bénézit. 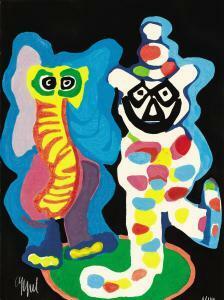 Karel Appel: "Personnage". Signed Appel70; signed, titled and dated on the reverse. Acrylic on paper laiddown on canvas. 64 x 49 cm. "Personnage". Signed Appel 70; signed, titled and dated on thereverse. Acrylic on paper laid down on canvas. 64 x 49 cm. 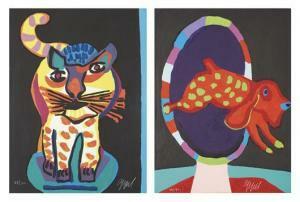 Circus Series: Cat; and Dog , 1978 Two wood engravings in colors with embossing, on Arches paper, the full sheets, both S. 30 x 22 1/2 in. (76.2 x 57.2 cm). both signed and numbered 88/130 and 61/130 respectively in white crayon (there were also 20 artist's proofs in Roman numerals), published by ABCD Editions, both in good condition, Cat framed, Dog contained in original folder. 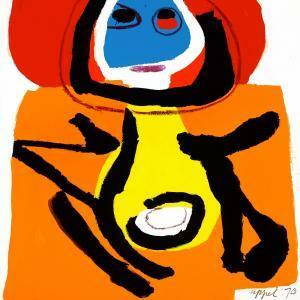 KAREL APPEL (Dutch,1921-2006) , 1978 Color woodcut with carborundum 30 x 22-1/4 inches (76.2 x 56.5 cm) Ed. 6/130 Signed lower left: Appel Inscribed lower right: Appel, Karel : Dutch painter and sculptor, born 1921,active in Amsterdam, Paris, and New York. Born 25 April 1921. KarelAppel executed two free standing paintings for Tweede VrijzinnigChristelijk Lyceum, The Hague, in 1949-1956. His collaborators onthe project were J.J.P. Oud and Wessel Couzijn. In 1948 heco-founded the Cobra movement in Paris.